Our Custom Printed Nylon Flags 3 ft x 5 ft are proudly Made in the USA. 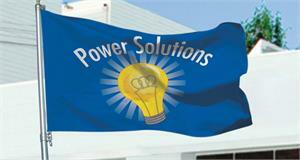 Our state of the art printers produce the highest quality and longest lasting flags and banner. Our custom printed flags will allow you to Connect with your customers, Promote your advertising flag campaign. Launch your new products. Stand out in a crowded advertising space. Generate buzz for your event or products. Draw people into your store or direct people to your location. Build brand loyalty. Create a positive image of you products and location. Activate your brand with advertising logo flags. CUSTOM PRINTED FLAG 12 IN X 18 IN , MADE IN THE USA, LONGEST LASTING. AS LOW AS $ 10.00 EACH, STANDARD FLAGS ARE SINGLE REVERSE PRINT, READS CORRECT ON FRONT SIDE AND REVERSE IMAGE ON BACK SIDE. CUSTOM PRINTED FLAG 2 FT X 3 FT, MADE IN THE USA, LONGEST LASTING. SEE QTY DISCOUNTS FOR THE LOWEST PRICES. STANDARD FLAGS ARE SINGLE REVERSE PRINT, READS CORRECT ON FRONT SIDE AND REVERSE IMAGE ON BACK SIDE. CUSTOM PRINTED FLAG 4 ft x 6 ft , MADE IN THE USA, LONGEST LASTING. SEE QTY DISCOUNTS FOR THE LOWEST PRICES. STANDARD FLAGS ARE SINGLE REVERSE PRINT, READS CORRECT ON FRONT SIDE AND REVERSE IMAGE ON BACK SIDE. PROUDLY MADE IN THE USA. CUSTOM PRINTED FLAG 5 ft x 8 ft , MADE IN THE USA, LONGEST LASTING. SEE QTY DISCOUNTS FOR THE LOWEST PRICES. STANDARD FLAGS ARE SINGLE REVERSE PRINT, READS CORRECT ON FRONT SIDE AND REVERSE IMAGE ON BACK SIDE. PROUDLY MADE IN THE USA. CUSTOM PRINTED FLAG 6 ft x 10 ft , MADE IN THE USA, LONGEST LASTING. SEE QTY DISCOUNTS FOR THE LOWEST PRICES. STANDARD FLAGS ARE SINGLE REVERSE PRINT, READS CORRECT ON FRONT SIDE AND REVERSE IMAGE ON BACK SIDE. PROUDLY MADE IN THE USA.